By building locally to fight poverty globally the typical Homes for Hope project empowers over 2,000 thousand families to break the chains of physical and spiritual poverty through small business loans, savings services, and training. It’s a powerful experience to witness the transformation first hand on one of our Experiencing HOPE trips. But what about those around you in your daily work. Are they experiencing the love of Christ through you? If you are building Homes for Hope then the answer is probably yes. However, it has been my experience that life gets hectic in our industry leaving very little room for freeing people who are spiritually impoverished in our own backyards. If you have decided to build a Home for Hope, we challenge you to invite the Holy Spirit into the process through prayer. Ask him to guide your eyes and heart towards the things that He cares about. Scripture says, “It is He who reveals the profound and hidden things…” (Daniel 2:22), and what He reveals may surprise you. 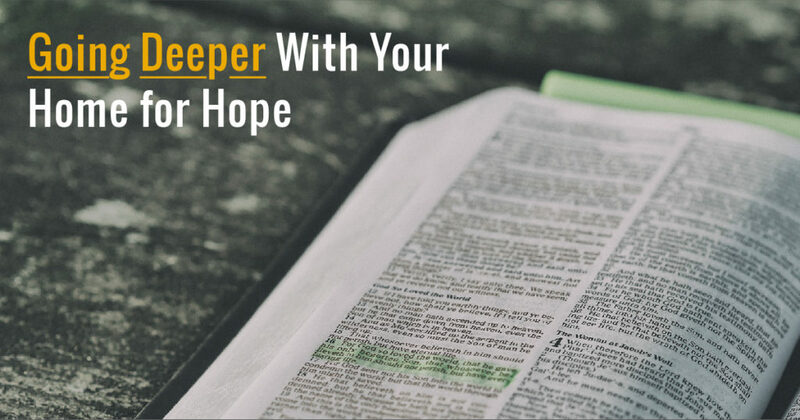 When you are recruiting trade partners to get involved in your Home for Hope project, start by making a list of them and praying over them daily. When you do, try asking God to reveal who you should contact. If you feel Him leading, then schedule a personal meeting or call with that trade partner. Sharing your decision to build a Home for Hope is far more powerful when you share the reason you’re doing it. Every time you speak with a trade partner, give a speech, or shoot a video about Homes for Hope – you have an opportunity to share your testimony and redirect the praise to Christ. What do you think about these three steps above? Have any questions or recommendations you would like to share with us? If so, I’d love to talk about it with you.